Create a seamless look to pocket holes, or use in another color as an accent! Our 3/8" pocket hole plugs are available in three different species and paint grade, letting you achieve the look you want for your project. The plugs fit perfect. There was a minimal amount of sanding to bring them flush with the wood. A very smooth operation. 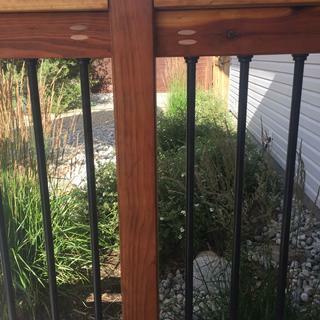 I used the cedar plugs in redwood railing and they really give a nice contrast and a more finished look. 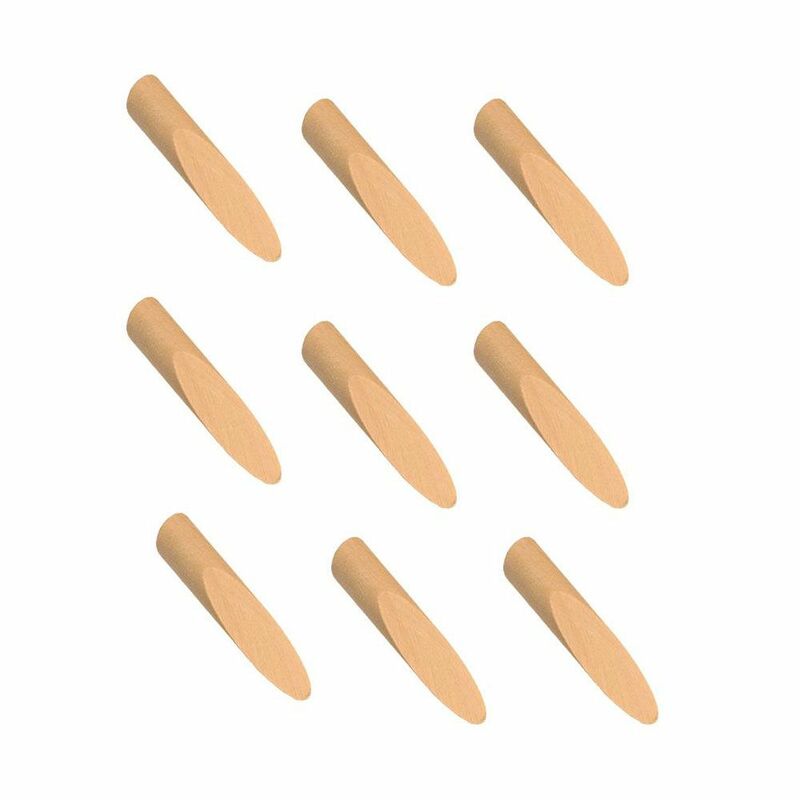 I have used them on many projects. I have used them in the past and felt they were a good finishing touch. I would recommend them. Excellent and very easy to use. The paint grade plugs are almost invisible after prime and finish coats. It's a great product. I used the pocket hole plugs using the Kreg system for building some guitar cabinets. It worked really well. It was easy to use. Very strong. Although the plugs had to be fitted. It turned out to make a nice flush area. There were no signs of where the plugs were after I sanded and painted them. I like the product because they cover the hole where you put the and it makes the project look professional and finished. 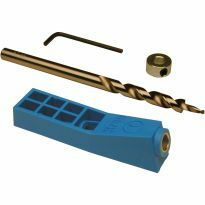 Kreg has got a superb product in their pocket hole system. I usually look for flaws in any product right when I get it to determine what kind of quality and what kind of a deal I got. I was pleased with Kreg immediately. The plugs made of a variety of wood species match my projects completely and finish almost invisibly. I would recommend the system to anyone. I recently finished some mobile closet shelf systems. I used the Kreg system to drill all the pocket holes, and as I set the screws into place, I could feel the components firm perfectly. No dowels or bisquet joinery is as easy or as fool proof, easy or quick. You cannot go wrong. Buy the full system rather than component parts one by one. You'll find you'll need them soon as you think of other projects. Just the finishing touch needed to make my project perfect. Easy to use and good fit. Good fit and easy to use. Makes any project look great. I love the pocket hole plugs - now my cabinets look finished, inside & out. Prompt delivery. Plugs fit nicely into any thickness. 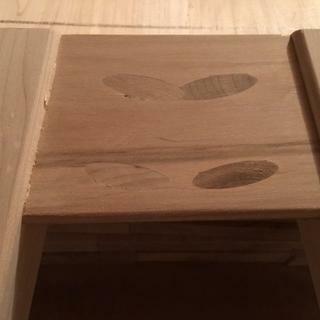 Extra material is easily removed with a flush cut saw and some minor sanding. I found the pine plugs worked perfectly. Packaging good. Product works as expected. Quality excellent. Shipping prompt. I have been using your pocket hole plugs for years as I like using pocket holes for joints. They work great and help finish the look on a job. 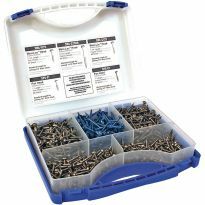 I've always had good results with products from Kreg. For the most part I can determine when its operator error or something is wrong with the product. However, I can't figure out what is going on with my pocket hole jig kit. I don't get clean cut holes consistently. There seems to be more play in the three hole jig vs the portable single hole jig. My bits are sharp. I purchased a new one to compare it to the one I have. The quality of the hole doesn't come into play until I do exposed with plugs. Hard to match a filler even with the same material. The premade plugs have their own issues. They very in color and diameter but that's a given with most wood. 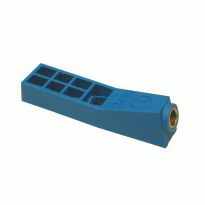 I've been thinking about purchasing the Kreg Plug Maker. Right now I can't afford the seventy dollars and I'm wondering if I'll have the same inconsistences as with the hole maker. Which brings to mind, will the plug maker be going on sale anytime in the near future? pocket hole plugs work well; require a reasonable amount of sanding but don't always fill the hole made by the Kreg drill bit. I use it for a different purpose. I use the plugs as an accent for different colors in some of my cutting boards. I built a display cabnet for my wife's Quilts and used the kreg joint system. I am pleased with the out come, only one complant is I found the plugs a little long and had to sand then down to fit flush.Now I have to build one for her sister, no good deed goes unpunished. lol. Building kitchen cabinets from knotty pine. Tried to make my own plugs but pine is just too soft and too many to make. I had to cut them flush after glue up but pine is very soft and it went quick. A little filler and the holes disappear, gone. I like the results and so does my customer. Pocket screws are the way to go, a little glue and NO CLAMPING or wait. The pocket hole plugs worked great. Several of the pocket holes were visible in the mirrors of a large display cabinet that I built and the plugs made them almost invisible. 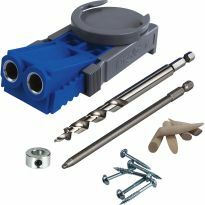 I purchased the Kreg pocket hole kit along with the plugs and I am very pleased. The pocket hole plugs fit perfectly inside the hole. The only suggestion I would have would be to have different sizes of plugs depending on the thickness of material. You have to cut the plug down depending on the thickness. But, very nice product. I am going to use these on many of my projects in the future. Shipping was prompt. Hardwood plugs slightly oversized, required some extra sanding. They worked great on our project. They didn't stain exactly like the other wood but that is to be expected since there are so many different kinds of pine. The Kreg System is a good way to join wood. The plug fit well, however, the color of the plugs was very disappointed. I ordered Maple but over half were darker than Walnut. I do realize Country Maple has a large variety of colors from a yellowish white to a dark brown. 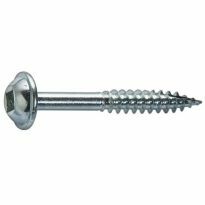 Works great to conceal hole and screw. Needs to be sanded before use, then planed and sanded after installation to accommodate different size stock which adds to project time. They work, but made from new growth pine and difficult to cut and sand. I think aspen would be a better choice. I had a little trouble with joining walnut due to the tightness of the grain and the pocket hole screws kept splitting the wood when I screwed them in. To avoid it I drilled the wood at the 1/2&quot; depth that stopped the splitting but then when I tried to insert the plugs the hole was too shallow and the plug would have never stayed in the slot once I tried to trim off the excess. So I ended up never using them. 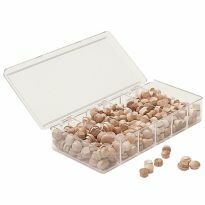 These could easily be made for different depth of drilling and would require less trimming and sanding to save time. I have the very first Pocket Hole Jig that Craig Sommerfield made many many years ago. 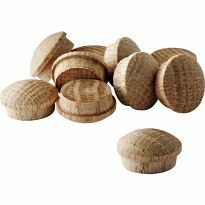 I have used thousands of oak plugs and never had a problem until this recent order from Rockler. The plugs are 1/32 narrower than the old ones and 1/8 of an inch shorter. One may say, so what, but this means more filling and less sanding and we all know that filler does not take stain very well. They also are loose in the actual pocket hole and not that snug fit that the older ones have. Rockler - what can you do about this? I called Cust Svc about this on 6/16 and the man I spoke to said that he noticed the same thing and just used more filler. They also suggested that I buy and $80 jig and cut my own. Anyone else encounter this problem or is it just that I received a bad batch? The plugs don't come close to fitting. Just cutting them to length isn't enough as the shape is still wrong and the hole shows. Carving them to fit is too time consuming to be worth the trouble. The plugs required quite a bit of cutting off for a flush finish. For that reason, I filled the holes with spackle as I am going to paint the piece. I will only use pocket screws if painting or if they can be hidden on the back side. 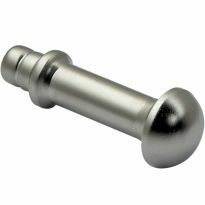 Pocket plugs seem to be made to conceal hole and screw heads when using certain material thickness. I have used the paintable ones on 3/4&quot; material and found that the back side of the plug (screw head side) is to long. I improvised a small jig to cut the extra material but still they don't come out right. Fortunately I used this plugs on a plywood and MFD project that is really not that important and have not started using the cherry ones that I got for an entertainment center that I'm building. I know now that I rather stay with biscuits and glue on the visible areas and not use the plugs at all. I wish I can return the two boxes that I have or maybe someone can tell me how to cut effectively the extra portion of the back side. Every plug in the package was oversized. When measured the diameter was 1/16&quot; larger than size shown on box. This is the only time that this has happened. All other packages were the right size. upcoming project making new kitchen cabinet doors with glass inserts that will be painted. Planning on using my Kreg pocket-hole jig. When you work with an array of different types of woods that are typically used this type generally speaking works out the best. Interested in trying a new joinery technique, and these are gorgeous. Use them all the time. Complete the inventory of plugs I have. To plug the holes that my new Mini Kreg Jig Pocket Hole Kit will make to ensure a smooth surface. Needed to plug some kreg slanted holes that would show. I love the pocket hole to join corners on my cabinets. Had to use pocket holes in a visible area to fasten a face frame. To hide pocket holes on a specific project. working on a project for my home. ORDERED BEFORE AND LIKE THE PRICE AND THE QUALITY. Ordered based on reviews. Will know more after I use the product. To fill pocket holes for painting a project. I've used these before, they make the final project look great. To plug the holes . 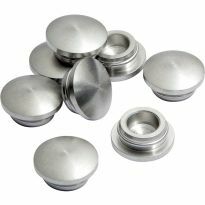 These perfectly shaped plugs provide a clean and matching filler to pocket holes. Provides a professional finished look to my woodworking projects. 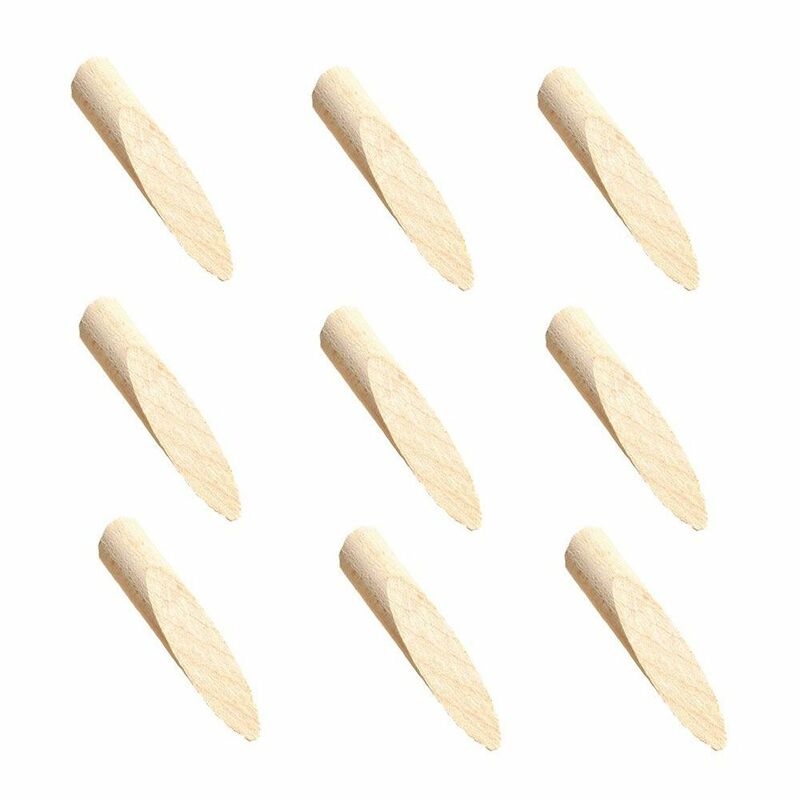 Ordered online because Cedar plugs are not available at big box retailers. Matched the maple cabinets I'm building. A perfect for my needs easy to apply, sand and stain or paint. Are there pocket hole plugs available for pocket hole created by a porter cable production cutter? What species would be best to plug a hole in knotty alder? Does anyone know if these plugs will work with the Porter Cable Jig pocket hole?? BEST ANSWER: I would expect they would as the drill bits are standard. They can be sanded flush as well. Where can I find mahogany plugs for a Kreg jig? what board thickness is recommended for the use of these plugs? Do you have cheery wood pocket hole plugs? 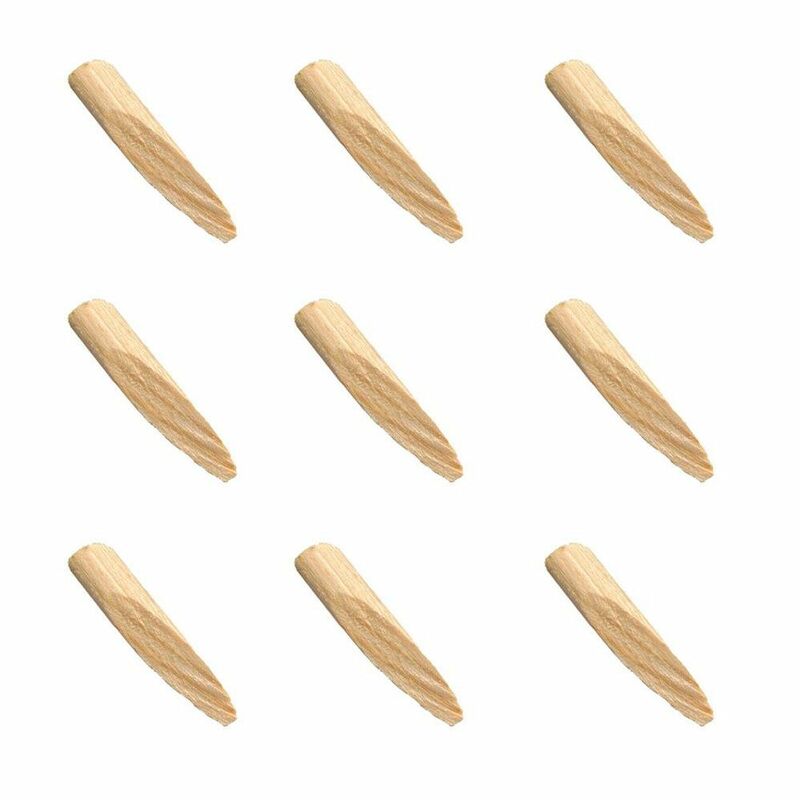 Are the oak plugs white oak or red oak?